Stop the assassinations of Rarámuri Indigenous Compañeros Defending Their Territory! We learned today of the murders of Indigenous Rarámuri compañeros Juan Ontiveros Ramos and Isidro Baldenegro, both of the community of Choreachi in the municipality of Guadalupe y Calvo, Chihuahua, yesterday February 2, and 15 days ago, respectively. We urgently denounce these new acts of barbarity against compañeros known for their commitment to the struggle of their people for the recuperation of their territory, which was taken over 40 years ago by large landowners/ranchers and organized crime. As the National Indigenous Congress and the Zapatista Army for National Liberation, we are in solidarity with the Rarámuri People who have been so hurt by these murders, now totaling 18 homicides committed against their communities since 1973, four of them in the last year. Compañeros and compañeras, you are not alone! We accompany you in your pain, we open our hearts to the tireless struggle you are waging against organized crime and the landowners backed by the bad governments, and we offer you our support as indigenous peoples of this country who are organizing ourselves to defend our lives and our territories. STOP THE ASSASSINATIONS OF INDIGENOUS PEOPLE IN STRUGGLE! Popol Vuh: Dawn came upon all the tribes together. The face of the earth was immediately cleansed by the sun (33). Dawn came to all the peoples who again and again have walked through different periods of history’s darkness and ignorance. We greet and congratulate our sisters of CODIMUJ(**) who celebrate 25 years of their journey. Aware of our reality, we, the Pueblo Creyente, are builders of alternatives, we are role models and we organise and demonstrate this by defending Mother Earth. We, the Publo Creyenete, are in motion in many places and in many ways. There is agreement that Pueblo Creyente is for people of faith. Our greatest desire is to fight for the freedom and an economy that will benefit our communities and we are united together in a shared struggle. For 25 years we have been putting our prophetic voice into action. “The law of the Lord is perfect and comforting to the soul, it is a law that would help God’s people to live in the freedom to which they had been called. A law that wanted to be the light for their footsteps and to accompany the pilgrimage of His people. People who had lived through slavery and the Pharaoh’s despotism, people who had lived suffering and abuse, until God said enough, until God said: No more! We have seen sorrow, I have heard the cry, I have known their anguish (cf. Ex 3, 9). The violence, the dispossession of our land, the territory and the natural resources. Cutting down trees. Mega-projects: super highways, eco-tourism projects, mining, dams, wind turbines, gas, petroleum, destruction of the ecosystem. Privatisation of natural resources. The cost of electricity and petrol. Agro-chemicals. Pollution, particularly of the water. Genetically modified seeds. Agricultural reform. Single-crop farming. In the political realm we denounce: The trickery of the political parties. The disease of power. The government’s projects. Structural reforms. Corruption and impunity. The government’s failure to listen to social demands. The authorities’ oppression and repression. We are not consulted when they make laws. “Public servants”, not servants of their own interests. Structural reforms, the free trade agreement, legalisation of dispossession, violence and impunity. We are opposed to the “PROCEDE” programme which will be the end of our ejidos. In the social realm: The divisions. Machismo. Violence against and exploitation of women. Improper use of the Internet. The use of pharmaceutical medicines, rather than the use of traditional medicine. The sale and consumption of alcohol and drugs. We denounce the government’s strategy which has used young people for drug trafficking and the consumption of drugs. Junk food. The water shortages caused by the privatisation of water. The projects and reactivation of hydroelectric dams. Infiltration and creation of groups to disrupt the people’s struggle. The oil wells. Physical illness. Social ills, violence in the family, prostitution. Organised crime. Hunger. The violation of migrants’ human rights, and the abuse and extortion carried out by migration officials, and the police and army because they have links to organised crime. Religious divisions. Militarisation of the territory, infiltration by powerful groups, organised crime. Lack of employment and public services, the dismantling of the health services and the shortage of medicine in hospitals. We also denounce those who use our sisters and brothers as cheap labour in their companies in the north of the country, working as they do in slave-like conditions. To build autonomy in our communities, recovering our structures of governance. As Pueblo Creyente, we are not a specific organisation, as Mexican citizens, we have the experience and legal space to build our alternative political and economic systems. We need to keep up our resistance to these projects of death and recover our autonomous governments, our communities. Already in the run up to the 2018 elections, political parties are already controlling and organizing their people in communities, and we urge people not to sell out. Let us fight for our dignity and for the truth, let’s not be sell-outs. Oxchuc is an example of a community undergoing this process of recovery. As Pueblo Creyente we are defending Mother Earth and the territory through our way of life and pilgrimages and prayers. We are self-organised, and we keep ourselves informed through the alternative media. These are processes of becoming aware of reality. Unity, Conscious raising, Dignified Lives, Autonomy, Self-government, Fraternity, Self-expression, Alternative social structures, Native Seeds, Autonomous food security. A government for the community, Freedom, Resistance, our Ancestors´ Wisdom, True Life, People Power, Community halls, Care for all the plants, animals and other species, and Justice. collectives and organisations that defend life. Those who defend the rights of women, like CODIMUJ. We share the CNI’s objective of the desire to strengthen the voices of our communities and create our autonomy. We express our solidarity with the families of the thousands of disappeared people. We urge other communities to unite because it is necessary to unite our people and our territory, do not be afraid to join us. Fear is a tool Big Money uses to paralyse us. We are encouraged by the words of Pope Francisco: “now is the time to mobilise”. May the Heart of Heaven and the Heart of the Earth, owner and creator of man, woman and nature, enlighten us and strengthen us in our walk. Photos: Frayba and the Abejas of Acteal Communication Team. The working group No Estamos Todxs and the centre of human rights Fray Bartolomé de Las Casas AC, express our concern regarding the risk to the freedom of our compañero Roberto Paciencia Cruz (Roberto Paciencia) who is an Indigenous Tsostil of Chenalhó, Chiapas and an adherent to the Sixth Declaration of the Lacandona Jungle. Roberto was detained August 9th, 2013 and accused of abduction. During the moment of his detention and incarceration, acts of torture, arbitrary detention and unfair trial were documented, violating the rights of personal freedom and integrity, personal security and access to due process. Since his detention, and throughout the judicial process that lasted three years and three months, Roberto did not cease his struggle against the injustices of the corrupt Mexican political system. On November 26, 2016, he was released by acquittal under the recognition of his innocence on part of the Judge of the criminal branch of the judicial district of San Cristóbal de Las Casas. However, the public prosecutor has filed an appeal against the acquittal, despite not having been able to sustain the accusation against our compañero Paciencia during the trial, and in spite of the mentioned violations against him. The arbitrary and unjust detention to which Roberto was subjected has brought physical and psychological consequences for him and his family, disrupting his life and generating poverty in his family. The probability of his acquittal being modified has generated uncertainty, stress and anxiety for Roberto, as well as for his family. During the months following his release, Roberto has moved to San Cristóbal de Las Casas, where he has tried to continue his life together with his family. Right now he is working and continuing the struggle. During the years that he was detained in CERSS Number 5, in San Cristóbal de Las Casas, he continued to defend the right of the prisoners, showing solidarity and commitment to the imprisoned survivors of torture and politically motivated criminalization. He did not stop denouncing the many abuses committed by the authorities, like the unjust and corrupt penitentiary and judicial system that discriminates against people for being poor and Indigenous. The working group No Estamos Todxs and the Centre for Human Rights Fray Bartolomé de Las Casas AC, reiterate our concern regarding the risk to the freedom of Roberto Paciencia and we urge the judge Ramiro Joel Ramírez Sánchez and the members of the Regional Mixed Collegiate Courtroom Zone 3, of San Cristóbal de Las Casas, to confirm the acquittal, for not having legal means to revoke the sentence. On December 19, the Fray Bartolome de las Casas Centre for Human Rights (CDHFBC) presented its “Annual Report: Paths of Resistance”, in an event attended by Marina Pages, coordinator of the International Service for Peace (SIPAZ); Ana Valadez Ortega, member of the Centre for Studies for Change in the Mexican Field (CECCAM); Rafael Landerreche Morin, member of the Pastoral Team of Chenalho; Marcelo Perez Perez, parish priest of Simojovel and coordinator of the Social Pastoral of the Chiapas Province, as well as Pedro Faro Navarro, director of CDHFBC. !24 de Noviembre, 2016. Roberto Paciencia ya esta libre! On November 10, relatives of Roberto Paciencia Cruz, Sympathizers with The Voice of Amate and the Working Group “No Estamos Todxs” (GTNET in its Spanish acronym) announced at a press conference at the Fray Bartolomé de las Casas Human Rights Centre (CDHFBC or Frayba) that on November 26, William Hernandez Ovando, Judge of the Criminal Law Section of San Cristobal de Las Casas District, will deliver a sentence on the case of Roberto. Roberto Paciencia, indigenous Tsotsil, campesino and adherent to the Sixth Declaration of the Lacandon Jungle; “Victim of Torture, Cruel, Inhuman and/or Degrading Treatment, Arbitrary Deprivation of Liberty and Violations of Due Process” was arrested on August 7, 2013, in the municipality of Pantelho, Chiapas, and transferred to the premises of the Specialized Prosecutor against Organized Crime’s Office (FECDO in its Spanish acronym) in Tuxtla Gutierrez. In this place, Roberto was physically and psychologically tortured for two days and locked in a punishment cell. He was later transferred to the State Centre for Social Reintegration of Sentenced Persons (CERSS) No. 5 of San Cristobal de Las Casas, where he is currently held, without sentence. Victims’ relatives and survivors continue to denounce, “constant harassment, intimidation and persecution with unjust arrest warrants and subpoenas, with threats of fines, by the justice administration system in Chiapas.” They request that the Inter-American Commission on Human Rights (IACHR) continue its monitoring and determine the responsibility of the Mexican State for human rights violations committed in the context of the Internal Armed Conflict. Urgent information about the communiqué from the officialist commissioner of San Sebastián Bachajón. The compañeros Ejidatarios of La Sexta Ejido Bachajon warn us that the communiqué issued by the officialist [government-supporting] commissioner of San Sebastian Bachajon, published on the website of Chiapas Denuncia Pública [Frayba] does not represent the thinking and the struggle of the ejidatarios and ejidatarias of La Sexta Bachajon. Compañeros and compañeras, we ask for your help in giving more publicity to this urgent information about the communiqué from the officialist commissioner of San Sebastián Bachajón. We send you our combative greetings, and give all due respect for your organizations and peoples in resistance. We want to say a few words, although for now they will be short but clear and will leave no doubt about what is happening in our territory. The officialist ejidal commissioner of San Sebastián Bachajón released a communiqué today September 30, 2016 (http://chiapasdenuncia.blogspot.mx/2016/09/ejido-san- sabastian-Bachajon-exige.html ), but it does not represent the thought and struggle of the ejidatarios and ejidatarias of La Sexta San Sebastian Bachajón, because it does not respect the territory and autonomy of our people nor does it respect his commitment when he was campaigning to become Commissioner, because he said he would not allow the bad government’s police to remain in our lands, but that is what he is currently doing and trying to fool the public that his movement is truly a struggle when in reality he is pursuing other interests. His actions make us think that he is in the service of the projects and plans of the bad government. 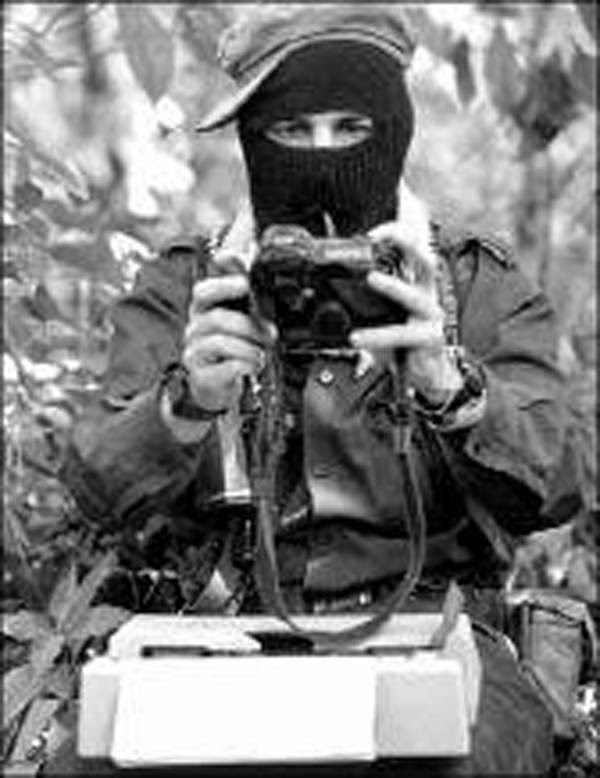 In the ejido San Sebastián Bachajón our autonomous organization has spent many years working in defence of the lands and many compañeros have lost their lives in defence of Mother Earth, for this reason we ask that you respect our struggle, our organization and our autonomous authorities. The police and bad government out of our territory. Information submitted to the United Nations (UN) Working Group on Business and Human Rights included the responsibility of businesses and the Mexican State in the violation of human rights in communities and towns in Chiapas. This UN body made an official visit to Mexico from 29 August to 7 September 2016 (1). The Businesses and Human Rights Report, written by a coalition of more than 100 organisations, communities and civil society networks includes documentation of the case of the Chicoasen II hydroelectric dam. This project affects the indigenous Zoque community who were previously displaced and stripped of their communal land in the 1980s by the dam Manuel Moreno Torres, which is better known as Chicoasen I. The ejido committee representing the Chicoasen communal landowners and the neighbouring landholders (the Ejido Chicoasen Committee from Chiapas) reported to the UN human rights abuses: lack of access to a prior and informed consultation, with culturally appropriate information, and abuse of land and territory. The accused are the Federal Electricity Commission (CFE as it is known by its Spanish initials) and the companies Sinohydro Costa Rica, Omega Construction, Urban Development and Construction and Infrastructure Caabsa. This has been the case since the hydroelectric dam project Chicoasen II began in 2012. The company Sinohydro Costa Rica, with the parent company headquartered in Beijing, has a history of human rights abuses for its involvement in the hydroelectric dam project Agua Zarca. The Council of Popular and Indigenous Organisations of Honduras (COPINH as it is known by its Spanish initials) denounced the company for the same strategies used in Chicoasen: forging signatures, imposing ejido commissioners, harassing, attacking and threatening local farmers with the complicity of the local authorities. It is also worth remembering that Bertha Cáceres, environmentalist, COPINH leader, human rights defender and winner of the Goldman prize, an environmental award, was killed in March 2016 in the context of the Lenca people’s struggle against the dam. This event raised alarm about the serious risk people defending land face in Latin America. The criminalisation of human rights defenders was documented as another violation of human rights as in the case of the construction of the hydroelectric dam Chicoasen II. Between 2010 and 2016 the members of the the Ejido Chicoasen Committee have been the subject of threats, attempted arbitrary deprivation of life, arbitrary deprivation of freedom, prosecution, criminalisation of protest and they have had to struggle with internal community divisions. The ejido’s lawyer Arturo Luna Ortega was detained by state police and accused of inciting rioting and held in prison from 21 October 2015 for three months because of a complaint made by the CFE. Further, there are arrest orders for other members of the resistance (2). Owing to the risks to life, the integrity and security of people opposing the Chicoasen II project, the Fray Bartolomé de Las Casas Human Rights Centre maintains a request for precautionary measures with the Inter-American Commission on Human Rights. Frayba demonstrated that the megaprojects in Chiapas, in the majority mining, hydroelectric, tourism and plantations follow a strategy of dispossession: implementation of authoritarian processes, lack of a prior and informed consultation with the communities affected, conspiracy between the three levels of government, modification of rules and laws, violence, criminalisation and prosecution for those who resist or oppose their plan. Historically and in the present, indigenous communities are subject to serious human rights violations. Dispossession has affected community life and the cultural heritage of indigenous communities. Further, the environment in indigenous territory in Chiapas is being affected by the large proportion of the state being held in concession for exploration and exploitation for extractive projects. Therefore the Ejido Chicoasen Committee and Frayba attended the meeting of the UN Working Group on Business and Human Rights held on 4 September 2016 in the community of San Francisco, Xochicuatla, Mexico state. There we reiterated the obligation of the Mexican State to ensure the protection of human rights globally and universally, including those related to land, territory and the environment. In particular, we want the Mexican State to strengthen and comply with the regulatory framework and control of all business sectors, with an emphasis on those related to large-scale projects and the extractive industry in order to ensure the protection of human rights. The State and companies must comply and respect collective rights, like autonomy and the right to land and territory of the indigenous peoples and communities of African heritage.